"Coax" redirects here. For the act of coaxing, see Persuasion. Coaxial cable, or coax (pronounced /ˈkoʊ.æks/) is a type of electrical cable that has an inner conductor surrounded by a tubular insulating layer, surrounded by a tubular conducting shield. Many coaxial cables also have an insulating outer sheath or jacket. The term coaxial comes from the inner conductor and the outer shield sharing a geometric axis. Coaxial cable was invented by English engineer and mathematician Oliver Heaviside, who patented the design in 1880. Coaxial cable is used as a transmission line for radio frequency signals. Its applications include feedlines connecting radio transmitters and receivers to their antennas, computer network (e.g., Ethernet) connections, digital audio (S/PDIF), and distribution of cable television signals. One advantage of coaxial over other types of radio transmission line is that in an ideal coaxial cable the electromagnetic field carrying the signal exists only in the space between the inner and outer conductors. This allows coaxial cable runs to be installed next to metal objects such as gutters without the power losses that occur in other types of transmission lines. Coaxial cable also provides protection of the signal from external electromagnetic interference.
) is determined by the dielectric constant of the inner insulator and the radii of the inner and outer conductors. In radio frequency systems, where the cable length is comparable to the wavelength of the signals transmitted, a uniform cable characteristic impedance is important to minimize loss. The source and load impedances are chosen to match the impedance of the cable to ensure maximum power transfer and minimum standing wave ratio. Other important properties of coaxial cable include attenuation as a function of frequency, voltage handling capability, and shield quality. The insulator surrounding the inner conductor may be solid plastic, a foam plastic, or air with spacers supporting the inner wire. The properties of the dielectric insulator determine some of the electrical properties of the cable. A common choice is a solid polyethylene (PE) insulator, used in lower-loss cables. Solid Teflon (PTFE) is also used as an insulator. Some coaxial lines use air (or some other gas) and have spacers to keep the inner conductor from touching the shield. Many conventional coaxial cables use braided copper wire forming the shield. This allows the cable to be flexible, but it also means there are gaps in the shield layer, and the inner dimension of the shield varies slightly because the braid cannot be flat. Sometimes the braid is silver-plated. For better shield performance, some cables have a double-layer shield. The shield might be just two braids, but it is more common now to have a thin foil shield covered by a wire braid. Some cables may invest in more than two shield layers, such as "quad-shield", which uses four alternating layers of foil and braid. Other shield designs sacrifice flexibility for better performance; some shields are a solid metal tube. Those cables cannot be bent sharply, as the shield will kink, causing losses in the cable. When a foil shield is used a small wire conductor incorporated into the foil makes soldering the shield termination easier. For high-power radio-frequency transmission up to about 1 GHz, coaxial cable with a solid copper outer conductor is available in sizes of 0.25 inch upward. The outer conductor is corrugated like a bellows to permit flexibility and the inner conductor is held in position by a plastic spiral to approximate an air dielectric. One brand name for such cable is Heliax. While many cables have a solid dielectric, many others have a foam dielectric that contains as much air or other gas as possible to reduce the losses by allowing the use of a larger diameter center conductor. Foam coax will have about 15% less attenuation but some types of foam dielectric can absorb moisture—especially at its many surfaces — in humid environments, significantly increasing the loss. Supports shaped like stars or spokes are even better but more expensive and very susceptible to moisture infiltration. Still more expensive were the air-spaced coaxials used for some inter-city communications in the mid-20th century. The center conductor was suspended by polyethylene discs every few centimeters. In some low-loss coaxial cables such as the RG-62 type, the inner conductor is supported by a spiral strand of polyethylene, so that an air space exists between most of the conductor and the inside of the jacket. The lower dielectric constant of air allows for a greater inner diameter at the same impedance and a greater outer diameter at the same cutoff frequency, lowering ohmic losses. Inner conductors are sometimes silver-plated to smooth the surface and reduce losses due to skin effect. A rough surface extends the current path and concentrates the current at peaks, thus increasing ohmic loss. The insulating jacket can be made from many materials. A common choice is PVC, but some applications may require fire-resistant materials. Outdoor applications may require the jacket to resist ultraviolet light, oxidation, rodent damage, or direct burial. Flooded coaxial cables use a water blocking gel to protect the cable from water infiltration through minor cuts in the jacket. For internal chassis connections the insulating jacket may be omitted. Twin-lead transmission lines have the property that the electromagnetic wave propagating down the line extends into the space surrounding the parallel wires. These lines have low loss, but also have undesirable characteristics. They cannot be bent, tightly twisted, or otherwise shaped without changing their characteristic impedance, causing reflection of the signal back toward the source. They also cannot be buried or run along or attached to anything conductive, as the extended fields will induce currents in the nearby conductors causing unwanted radiation and detuning of the line. Coaxial lines largely solve this problem by confining virtually all of the electromagnetic wave to the area inside the cable. Coaxial lines can therefore be bent and moderately twisted without negative effects, and they can be strapped to conductive supports without inducing unwanted currents in them. In radio-frequency applications up to a few gigahertz, the wave propagates primarily in the transverse electric magnetic (TEM) mode, which means that the electric and magnetic fields are both perpendicular to the direction of propagation. However, above a certain cutoff frequency, transverse electric (TE) or transverse magnetic (TM) modes can also propagate, as they do in a waveguide. It is usually undesirable to transmit signals above the cutoff frequency, since it may cause multiple modes with different phase velocities to propagate, interfering with each other. The outer diameter is roughly inversely proportional to the cutoff frequency. A propagating surface-wave mode that does not involve or require the outer shield but only a single central conductor also exists in coax but this mode is effectively suppressed in coax of conventional geometry and common impedance. Electric field lines for this [TM] mode have a longitudinal component and require line lengths of a half-wavelength or longer. Coaxial cable may be viewed as a type of waveguide. Power is transmitted through the radial electric field and the circumferential magnetic field in the TEM00 transverse mode. This is the dominant mode from zero frequency (DC) to an upper limit determined by the electrical dimensions of the cable. The ends of coaxial cables usually terminate with connectors. Coaxial connectors are designed to maintain a coaxial form across the connection and have the same impedance as the attached cable. Connectors are usually plated with high-conductivity metals such as silver or tarnish-resistant gold. Due to the skin effect, the RF signal is only carried by the plating at higher frequencies and does not penetrate to the connector body. Silver however tarnishes quickly and the silver sulfide that is produced is poorly conductive, degrading connector performance, making silver a poor choice for this application. Coaxial cable is a particular kind of transmission line, so the circuit models developed for general transmission lines are appropriate. See Telegrapher's equation. Schematic representation of the elementary components of a transmission line.
. The relative permeability will almost always be 1. Shunt capacitance per unit length, in farads per metre. Series inductance per unit length, in henrys per metre. Series resistance per unit length, in ohms per metre. The resistance per unit length is just the resistance of inner conductor and the shield at low frequencies. At higher frequencies, skin effect increases the effective resistance by confining the conduction to a thin layer of each conductor. Shunt conductance per unit length, in siemens per metre. The shunt conductance is usually very small because insulators with good dielectric properties are used (a very low loss tangent). At high frequencies, a dielectric can have a significant resistive loss. Where R is the resistance per unit length, L is the inductance per unit length, G is the conductance per unit length of the dielectric, C is the capacitance per unit length, and s = jω = j2πf is the frequency. The "per unit length" dimensions cancel out in the impedance formula. With increasing frequency, the reactive components take effect and the impedance of the line is complex-valued. Assuming the dielectric properties of the material inside the cable do not vary appreciably over the operating range of the cable, the characteristic impedance is frequency independent above about five times the shield cutoff frequency. For typical coaxial cables, the shield cutoff frequency is 600 (RG-6A) to 2,000 Hz (RG-58C). Attenuation (loss) per unit length, in decibels per meter. This is dependent on the loss in the dielectric material filling the cable, and resistive losses in the center conductor and outer shield. These losses are frequency dependent, the losses becoming higher as the frequency increases. Skin effect losses in the conductors can be reduced by increasing the diameter of the cable. A cable with twice the diameter will have half the skin effect resistance. Ignoring dielectric and other losses, the larger cable would halve the dB/meter loss. In designing a system, engineers consider not only the loss in the cable but also the loss in the connectors. Velocity of propagation, in meters per second. The velocity of propagation depends on the dielectric constant and permeability (which is usually 1). Hence, the cable is single-mode from to d.c. up to this frequency, and might in practice be used up to 90% of this frequency. The 1150 factor converts inches (diameter) to mils (radius) and log10 to ln. The calculated peak voltage is often reduced by a safety factor. 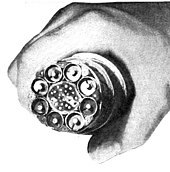 The best coaxial cable impedances in high-power, high-voltage, and low-attenuation applications were experimentally determined at Bell Laboratories in 1929 to be 30, 60, and 77 Ω, respectively. For a coaxial cable with air dielectric and a shield of a given inner diameter, the attenuation is minimized by choosing the diameter of the inner conductor to give a characteristic impedance of 76.7 Ω. When more common dielectrics are considered, the best-loss impedance drops down to a value between 52–64 Ω. Maximum power handling is achieved at 30 Ω. The approximate impedance required to match a centre-fed dipole antenna in free space (i.e., a dipole without ground reflections) is 73 Ω, so 75 Ω coax was commonly used for connecting shortwave antennas to receivers. These typically involve such low levels of RF power that power-handling and high-voltage breakdown characteristics are unimportant when compared to attenuation. Likewise with CATV, although many broadcast TV installations and CATV headends use 300 Ω folded dipole antennas to receive off-the-air signals, 75 Ω coax makes a convenient 4:1 balun transformer for these as well as possessing low attenuation. The arithmetic mean between 30 Ω and 77 Ω is 53.5 Ω; the geometric mean is 48 Ω. The selection of 50 Ω as a compromise between power-handling capability and attenuation is in general cited as the reason for the number. 50 Ω also works out tolerably well because it corresponds approximately to the drive impedance (ideally 36 ohms) of a quarter-wave monopole, mounted on a less than optimum ground plane such as a vehicle roof. The match is better at low frequencies, such as for CB Radio around 27 MHz, where the roof dimensions are much less than a quarter wavelength, and relatively poor at higher frequencies, VHF and UHF, where the roof dimensions may be several wavelengths. The match is at best poor, because the antenna drive impedance, due to the imperfect ground plane, is reactive rather than purely resistive, and so a 36 ohm coaxial cable would not match properly either. Installations which need exact matching will use some kind of matching circuit at the base of the antenna, or elsewhere, in conjunction with a carefully chosen (in terms of wavelength) length of coaxial, such that a proper match is achieved, which will be only over a fairly narrow frequency range. RG-62 is a 93 Ω coaxial cable originally used in mainframe computer networks in the 1970s and early 1980s (it was the cable used to connect IBM 3270 terminals to IBM 3274/3174 terminal cluster controllers). Later, some manufacturers of LAN equipment, such as Datapoint for ARCNET, adopted RG-62 as their coaxial cable standard. The cable has the lowest capacitance per unit-length when compared to other coaxial cables of similar size. All of the components of a coaxial system should have the same impedance to avoid internal reflections at connections between components. Such reflections may cause signal attenuation and ghosting TV picture display; multiple reflections may cause the original signal to be followed by more than one echo. In analog video or TV systems, this causes ghosting in the image. Reflections also introduce standing waves, which cause increased losses and can even result in cable dielectric breakdown with high-power transmission (see Impedance matching). Briefly, if a coaxial cable is open, the termination has nearly infinite resistance, this causes reflections; if the coaxial cable is short-circuited, the termination resistance is nearly zero, there will be reflections with the opposite polarity. Reflection will be nearly eliminated if the coaxial cable is terminated in a pure resistance equal to its impedance. Coaxial Cable Dimensions. D is the radius of the larger conductor and d is the radius of the smaller conductor. Signal leakage is the passage of electromagnetic fields through the shield of a cable and occurs in both directions. Ingress is the passage of an outside signal into the cable and can result in noise and disruption of the desired signal. Egress is the passage of signal intended to remain within the cable into the outside world and can result in a weaker signal at the end of the cable and radio frequency interference to nearby devices. Severe leakage usually results from improperly installed connectors or faults in the cable shield. For example, in the United States, signal leakage from cable television systems is regulated by the FCC, since cable signals use the same frequencies as aeronautical and radionavigation bands. CATV operators may also choose to monitor their networks for leakage to prevent ingress. Outside signals entering the cable can cause unwanted noise and picture ghosting. Excessive noise can overwhelm the signal, making it useless. An ideal shield would be a perfect conductor with no holes, gaps, or bumps connected to a perfect ground. However, a smooth solid highly conductive shield would be heavy, inflexible, and expensive. Such coax is used for straight line feeds to commercial radio broadcast towers. More economical cables must make compromises between shield efficacy, flexibility, and cost, such as the corrugated surface of flexible hardline, flexible braid, or foil shields. Since shields cannot be perfect conductors, current flowing on the inside of the shield produces an electromagnetic field on the outer surface of the shield. Consider the skin effect. The magnitude of an alternating current in a conductor decays exponentially with distance beneath the surface, with the depth of penetration being proportional to the square root of the resistivity. This means that, in a shield of finite thickness, some small amount of current will still be flowing on the opposite surface of the conductor. With a perfect conductor (i.e., zero resistivity), all of the current would flow at the surface, with no penetration into and through the conductor. Real cables have a shield made of an imperfect, although usually very good, conductor, so there must always be some leakage. The gaps or holes, allow some of the electromagnetic field to penetrate to the other side. For example, braided shields have many small gaps. The gaps are smaller when using a foil (solid metal) shield, but there is still a seam running the length of the cable. Foil becomes increasingly rigid with increasing thickness, so a thin foil layer is often surrounded by a layer of braided metal, which offers greater flexibility for a given cross-section. Signal leakage can be severe if there is poor contact at the interface to connectors at either end of the cable or if there is a break in the shield. To greatly reduce signal leakage into or out of the cable, by a factor of 1000, or even 10,000, superscreened cables are often used in critical applications, such as for neutron flux counters in nuclear reactors. Superscreened cables for nuclear use are defined in IEC 96-4-1, 1990, however as there have been long gaps in the construction of nuclear power stations in Europe, many existing installations are using superscreened cables to the UK standard AESS(TRG) 71181 which is referenced in IEC 61917. A continuous current, even if small, along the imperfect shield of a coaxial cable can cause visible or audible interference. In CATV systems distributing analog signals the potential difference between the coaxial network and the electrical grounding system of a house can cause a visible "hum bar" in the picture. This appears as a wide horizontal distortion bar in the picture that scrolls slowly upward. Such differences in potential can be reduced by proper bonding to a common ground at the house. See ground loop. External fields create a voltage across the inductance of the outside of the outer conductor between sender and receiver. The effect is less when there are several parallel cables, as this reduces the inductance and, therefore, the voltage. Because the outer conductor carries the reference potential for the signal on the inner conductor, the receiving circuit measures the wrong voltage. The transformer effect is sometimes used to mitigate the effect of currents induced in the shield. The inner and outer conductors form the primary and secondary winding of the transformer, and the effect is enhanced in some high-quality cables that have an outer layer of mu-metal. Because of this 1:1 transformer, the aforementioned voltage across the outer conductor is transformed onto the inner conductor so that the two voltages can be cancelled by the receiver. Many sender and receivers have means to reduce the leakage even further. They increase the transformer effect by passing the whole cable through a ferrite core one or more times. Common mode current occurs when stray currents in the shield flow in the same direction as the current in the center conductor, causing the coax to radiate. Most of the shield effect in coax results from opposing currents in the center conductor and shield creating opposite magnetic fields that cancel, and thus do not radiate. The same effect helps ladder line. However, ladder line is extremely sensitive to surrounding metal objects, which can enter the fields before they completely cancel. Coax does not have this problem, since the field is enclosed in the shield. However, it is still possible for a field to form between the shield and other connected objects, such as the antenna the coax feeds. The current formed by the field between the antenna and the coax shield would flow in the same direction as the current in the center conductor, and thus not be canceled. Energy would radiate from the coax itself, affecting the radiation pattern of the antenna. With sufficient power this could be a hazard to people near the cable. A properly placed and properly sized balun can prevent common mode radiation in coax. An isolating transformer or blocking capacitor can be used to couple a coaxial cable to equipment, where it is desirable to pass radio-frequency signals but to block direct current or low-frequency power. Most coaxial cables have a characteristic impedance of either 50, 52, 75, or 93 Ω. The RF industry uses standard type-names for coaxial cables. Thanks to television, RG-6 is the most commonly used coaxial cable for home use, and the majority of connections outside Europe are by F connectors. A series of standard types of coaxial cable were specified for military uses, in the form "RG-#" or "RG-#/U". They date from World War II and were listed in MIL-HDBK-216 published in 1962. These designations are now obsolete. The RG designation stands for Radio Guide; the U designation stands for Universal. The current military standard is MIL-SPEC MIL-C-17. MIL-C-17 numbers, such as "M17/75-RG214", are given for military cables and manufacturer's catalog numbers for civilian applications. However, the RG-series designations were so common for generations that they are still used, although critical users should be aware that since the handbook is withdrawn there is no standard to guarantee the electrical and physical characteristics of a cable described as "RG-# type". The RG designators are mostly used to identify compatible connectors that fit the inner conductor, dielectric, and jacket dimensions of the old RG-series cables. 75 0.50 PE 0.85 3.0 5.4 Single Used to carry television, video observation systems, and other. PVC jacket. 75 0.80 PE 0.82±0.02 0.181 4.6 0.256 6.5 Double Used for interior lines for monitoring system, CCTV feeder lines, wiring between the camera and control unit and video signal transmission. PVC jacket. 50 1.024 PE 0.425 10.8 Single Used for high-definition cable TV and high-speed cable Internet. There are also other designation schemes for coaxial cables such as the URM, CT, BT, RA, PSF and WF series. Short coaxial cables are commonly used to connect home video equipment, in ham radio setups, and in measurement electronics. While formerly common for implementing computer networks, in particular Ethernet ("thick" 10BASE5 and "thin" 10BASE2), twisted pair cables have replaced them in most applications except in the growing consumer cable modem market for broadband Internet access. Long distance coaxial cable was used in the 20th century to connect radio networks, television networks, and Long Distance telephone networks though this has largely been superseded by later methods (fibre optics, T1/E1, satellite). Shorter coaxials still carry cable television signals to the majority of television receivers, and this purpose consumes the majority of coaxial cable production. In 1980s and early 1990s coaxial cable was also used in computer networking, most prominently in Ethernet networks, where it was later in late 1990s to early 2000s replaced by UTP cables in North America and STP cables in Western Europe, both with 8P8C modular connectors. Micro coaxial cables are used in a range of consumer devices, military equipment, and also in ultra-sound scanning equipment. The most common impedances that are widely used are 50 or 52 ohms, and 75 ohms, although other impedances are available for specific applications. The 50 / 52 ohm cables are widely used for industrial and commercial two-way radio frequency applications (including radio, and telecommunications), although 75 ohms is commonly used for broadcast television and radio. Coax cable is often used to carry data/signals from an antenna to a receiver—from a satellite dish to a satellite receiver, from a television antenna to a television receiver, from a radio mast to a radio receiver, etc. In many cases, the same single coax cable carries power in the opposite direction, to the antenna, to power the low-noise amplifier. In some cases a single coax cable carries (unidirectional) power and bidirectional data/signals, as in DiSEqC. Hard line is used in broadcasting as well as many other forms of radio communication. It is a coaxial cable constructed using round copper, silver or gold tubing or a combination of such metals as a shield. Some lower-quality hard line may use aluminum shielding, aluminum however is easily oxidized and unlike silver oxide, aluminum oxide drastically loses effective conductivity. Therefore, all connections must be air and water tight. The center conductor may consist of solid copper, or copper-plated aluminum. Since skin effect is an issue with RF, copper plating provides sufficient surface for an effective conductor. Most varieties of hardline used for external chassis or when exposed to the elements have a PVC jacket; however, some internal applications may omit the insulation jacket. Hard line can be very thick, typically at least a half inch or 13 mm and up to several times that, and has low loss even at high power. These large-scale hard lines are almost always used in the connection between a transmitter on the ground and the antenna or aerial on a tower. Hard line may also be known by trademarked names such as Heliax (CommScope), or Cablewave (RFS/Cablewave). Larger varieties of hardline may have a center conductor that is constructed from either rigid or corrugated copper tubing. The dielectric in hard line may consist of polyethylene foam, air, or a pressurized gas such as nitrogen or desiccated air (dried air). In gas-charged lines, hard plastics such as nylon are used as spacers to separate the inner and outer conductors. The addition of these gases into the dielectric space reduces moisture contamination, provides a stable dielectric constant, and provides a reduced risk of internal arcing. Gas-filled hardlines are usually used on high-power RF transmitters such as television or radio broadcasting, military transmitters, and high-power amateur radio applications but may also be used on some critical lower-power applications such as those in the microwave bands. However, in the microwave region, waveguide is more often used than hard line for transmitter-to-antenna, or antenna-to-receiver applications. The various shields used in hardline also differ; some forms use rigid tubing, or pipe, while others may use a corrugated tubing, which makes bending easier, as well as reduces kinking when the cable is bent to conform. Smaller varieties of hard line may be used internally in some high-frequency applications, in particular in equipment within the microwave range, to reduce interference between stages of the device. Radiating or leaky cable is another form of coaxial cable which is constructed in a similar fashion to hard line, however it is constructed with tuned slots cut into the shield. These slots are tuned to the specific RF wavelength of operation or tuned to a specific radio frequency band. This type of cable is to provide a tuned bi-directional "desired" leakage effect between transmitter and receiver. It is often used in elevator shafts, US Navy Ships, underground transportation tunnels and in other areas where an antenna is not feasible. One example of this type of cable is Radiax (CommScope). RG-6 is available in four different types designed for various applications. In addition, the core may be copper clad steel (CCS) or bare solid copper (BC). "Plain" or "house" RG-6 is designed for indoor or external house wiring. "Flooded" cable is infused with waterblocking gel for use in underground conduit or direct burial. "Messenger" may contain some waterproofing but is distinguished by the addition of a steel messenger wire along its length to carry the tension involved in an aerial drop from a utility pole. "Plenum" cabling is expensive and comes with a special Teflon-based outer jacket designed for use in ventilation ducts to meet fire codes. It was developed since the plastics used as the outer jacket and inner insulation in many "Plain" or "house" cabling gives off poison gas when burned. Triaxial cable or triax is coaxial cable with a third layer of shielding, insulation and sheathing. The outer shield, which is earthed (grounded), protects the inner shield from electromagnetic interference from outside sources. Twin-axial cable or twinax is a balanced, twisted pair within a cylindrical shield. It allows a nearly perfect differential signal which is both shielded and balanced to pass through. Multi-conductor coaxial cable is also sometimes used. Conformable cable is a flexible reformable alternative to semi-rigid coaxial cable used where flexibility is required. Conformable cable can be stripped and formed by hand without the need for specialized tools, similar to standard coaxial cable. At the start of analogue satellite TV broadcasts in the UK by BskyB, a 75 ohm cable referred to as RG6 was used. This cable had a 1 mm copper core, air-spaced polyethylene dielectric and copper braid on an aluminium foil shield. When installed outdoors without protection, the cable was affected by UV radiation, which cracked the PVC outer sheath and allowed moisture ingress. The combination of copper, aluminium, moisture and air caused rapid corrosion, sometimes resulting in a 'snake swallowed an egg' appearance. Consequently, despite the higher cost, the RG6 cable was dropped in favour of CT100 when BSKYB launched its digital broadcasts. From around 1999 to 2005 (when CT100 manufacturer Raydex went out of business), CT100 remained the 75 ohm cable of choice for satellite TV and especially BskyB. It had an air-spaced polyethylene dielectric, a 1 mm solid copper core and copper braid on copper foil shield. CT63 was a thinner cable in 'shotgun' style, meaning that it was two cables moulded together and was used mainly by BskyB for the twin connection required by the Sky+ satellite TV receiver, which incorporated a hard drive recording system and a second, independent tuner. In 2005, these cables were replaced by WF100 and WF65, respectively, manufactured by Webro and having a similar construction but a foam dielectric that provided the same electrical performance as air-spaced but was more robust and less likely to be crushed. At the same time, with the price of copper steadily rising, the original RG6 was dropped in favour of a construction that used a copper-clad steel core and aluminium braid on aluminium foil. Its lower price made it attractive to aerial installers looking for a replacement for the so-called low-loss cable traditionally used for UK terrestrial aerial installations. This cable had been manufactured with a decreasing number of strands of braid, as the price of copper increased, such that the shielding performance of cheaper brands had fallen to as low as 40 percent. With the advent of digital terrestrial transmissions in the UK, this low-loss cable was no longer suitable. The new RG6 still performed well at high frequencies because of the skin effect in the copper cladding. However, the aluminium shield had a high DC resistance and the steel core an even higher one. The result is that this type of cable could not reliably be used in satellite TV installations, where it was required to carry a significant amount of current, because the voltage drop affected the operation of the low noise block downconverter (LNB) on the dish. A problem with all the aforementioned cables, when passing current, is that electrolytic corrosion can occur in the connections unless moisture and air are excluded. Consequently, various solutions to exclude moisture have been proposed. The first was to seal the connection by wrapping it with self-amalgamating rubberised tape, which bonds to itself when activated by stretching. The second proposal, by the American Channel Master company (now owned by Andrews corp.) at least as early as 1999, was to apply silicone grease to the wires making connection. The third proposal was to fit a self-sealing plug to the cable. All of these methods are reasonably successful if implemented correctly. Coaxial cable insulation may degrade, requiring replacement of the cable, especially if it has been exposed to the elements on a continuous basis. The shield is normally grounded, and if even a single thread of the braid or filament of foil touches the center conductor, the signal will be shorted causing significant or total signal loss. This most often occurs at improperly installed end connectors and splices. Also, the connector or splice must be properly attached to the shield, as this provides the path to ground for the interfering signal. Despite being shielded, interference can occur on coaxial cable lines. Susceptibility to interference has little relationship to broad cable type designations (e.g. RG-59, RG-6) but is strongly related to the composition and configuration of the cable's shielding. For cable television, with frequencies extending well into the UHF range, a foil shield is normally provided, and will provide total coverage as well as high effectiveness against high-frequency interference. Foil shielding is ordinarily accompanied by a tinned copper or aluminum braid shield, with anywhere from 60 to 95% coverage. The braid is important to shield effectiveness because (1) it is more effective than foil at preventing low-frequency interference, (2) it provides higher conductivity to ground than foil, and (3) it makes attaching a connector easier and more reliable. "Quad-shield" cable, using two low-coverage aluminum braid shields and two layers of foil, is often used in situations involving troublesome interference, but is less effective than a single layer of foil and single high-coverage copper braid shield such as is found on broadcast-quality precision video cable. In the United States and some other countries, cable television distribution systems use extensive networks of outdoor coaxial cable, often with in-line distribution amplifiers. Leakage of signals into and out of cable TV systems can cause interference to cable subscribers and to over-the-air radio services using the same frequencies as those of the cable system. AT&T coaxial cable trunkline installed between East Coast and Midwest in 1948. Each of the 8 coaxial subcables could carry 480 telephone calls or one television channel. 1880 — Coaxial cable patented in England by Oliver Heaviside, patent no. 1,407. 1884 — Siemens & Halske patent coaxial cable in Germany (Patent No. 28,978, 27 March 1884). 1929 — First modern coaxial cable patented by Lloyd Espenschied and Herman Affel of AT&T's Bell Telephone Laboratories. 1936 — First closed circuit transmission of TV pictures on coaxial cable, from the 1936 Summer Olympics in Berlin to Leipzig. 1936 — World's first underwater coaxial cable installed between Apollo Bay, near Melbourne, Australia, and Stanley, Tasmania. The 300 km cable can carry one 8.5-kHz broadcast channel and seven telephone channels. 1936 — AT&T installs experimental coaxial telephone and television cable between New York and Philadelphia, with automatic booster stations every ten miles. Completed in December, it can transmit 240 telephone calls simultaneously. 1936 — Coaxial cable laid by the General Post Office (now BT) between London and Birmingham, providing 40 telephone channels. 1941 — First commercial use in USA by AT&T, between Minneapolis, Minnesota and Stevens Point, Wisconsin. L1 system with capacity of one TV channel or 480 telephone circuits. 1949 — On January 11, eight stations on the US East Coast and seven Midwestern stations are linked via a long-distance coaxial cable. 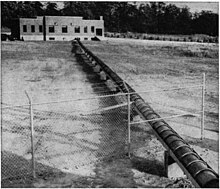 1956 — First transatlantic coaxial cable laid, TAT-1. 1962 — 960 km (600 mi) Sydney–Melbourne co-axial cable commissioned, carrying 3 x 1,260 simultaneous telephone connections, and-or simultaneous inter-city television transmission. ^ Nahin, Paul J. (2002). Oliver Heaviside: The Life, Work, and Times of an Electrical Genius of the Victorian Age. ISBN 0-8018-6909-9. ^ a b H. Ward Silver, N0AX; Mark J. Wilson, K1RO, eds. (2010). "Chapter 20: Transmission Lines". The ARRL Handbook for Radio Communications (87th ed.). The American Radio Relay League. ISBN 0-87259-144-1. ^ Martin J. Van Der Burgt. "Coaxial Cables and Applications" (PDF). Belden. p. 4. Archived from the original (PDF) on 2011-07-28. Retrieved 11 July 2011. ^ Jackson, John David (1962). Classical Electrodynamics. New York: John Wiley & Sons, Inc. p. 244. ^ Ott, Henry W. (1976). Noise Reduction Techniques in Electronic Systems. ISBN 0-471-65726-3. ^ Elmore, William C.; Heald, Mark A. (1969). Physics of Waves. ISBN 0-486-64926-1. ^ Kizer, George Maurice (1990). Microwave communication. Iowa State University Press. p. 312. ISBN 978-0-8138-0026-4. ^ a b "Coaxial Cable Equations Formulas". RF Cafe. Retrieved 2012-01-25. ^ "Why 50 Ohms?". Microwaves 101. 2009-01-13. Retrieved 2012-01-25. ^ "Coax power handling". Microwaves 101. 2008-09-14. Retrieved 2012-01-25. ^ "AESS(TRG) 71181 Part 2, May 1977 Superscreened co-axial cables for the nuclear power industry". ^ "IEC 61917 Cables, cable assemblies and connectors – Introduction to electromagnetic (EMC) screening measurements First edition 1998-06" (PDF). ^ "Coaxial Cable Specifications for RG-6". madaboutcable.com. Archived from the original on 2010-08-13. Retrieved 2011-06-28. ^ a b c d e f g h i j k l m n o p q r s t u "Times Microwave Coax Loss Calculator". Retrieved 2011-10-26. ^ "Coaxial Cable Specifications for RG-11". madaboutcable.com. Archived from the original on 2010-08-11. Retrieved 2011-03-29. ^ "Belden 7731A RG11 Coax" (PDF). belden.com. ^ "Coaxial Cable Specifications for RG-58". madaboutcable.com. Archived from the original on 2010-08-09. Retrieved 2011-03-29. ^ "Coaxial Cable Specifications for RG-59". madaboutcable.com. Archived from the original on 2010-08-11. Retrieved 2011-03-29. ^ "Cable Velocity Factor and Loss Data". febo.com. ^ "Coaxial Cable Specifications for RG-62". madaboutcable.com. Archived from the original on 2010-08-11. Retrieved 2011-03-29. ^ "Coaxial Cable Specifications for RG-178". madaboutcable.com. Archived from the original on 2011-09-28. Retrieved 2011-04-11. ^ "Coaxial Cable Specifications for 5 Core RG-179 (RGBHV)". madaboutcable.com. Archived from the original on 2012-03-30. Retrieved 2011-06-28. ^ "Coaxial Cable Specifications for RG-213". madaboutcable.com. Archived from the original on 2011-09-26. Retrieved 2011-06-28. ^ "Coaxial Cable Specifications for RG-214". madaboutcable.com. Archived from the original on 2010-10-08. Retrieved 2011-03-29. ^ "Coaxial Cable Specifications for RG-316". madaboutcable.com. Archived from the original on 2010-08-11. Retrieved 2011-06-28. ^ "Coaxial Cable Specifications for RG-400". madaboutcable.com. Archived from the original on 2011-09-28. Retrieved 2011-06-28. ^ "Times Microwave LMR-240 Data Sheet" (PDF). Retrieved 2011-10-26. ^ "Coaxial Cable Specifications Cables Chart". RF Cafe. Retrieved 2012-01-25. ^ "Phase Velocity". Microwaves 101. 2010-03-30. Retrieved 2012-01-25. ^ "Cablewave Radio Frequency Systems <http://www.rfsworld.com>". ^ Feldenkirchen, Wilfried (1994). Werner von Siemens - Inventor and International Entrepreneur. ISBN 0-8142-0658-1. ^ "Coaxial Debut," Time, Dec. 14, 1936. ^ Teachout, Terry. "The New-Media Crisis of 1949". Wall Street Journal. Retrieved 19 January 2015. ^ "Australia's Prime Ministers". National Archives of Australia. Retrieved 14 September 2013. ^ The Australasian Engineer, 1962, p.33. Wikimedia Commons has media related to Coaxial cables.